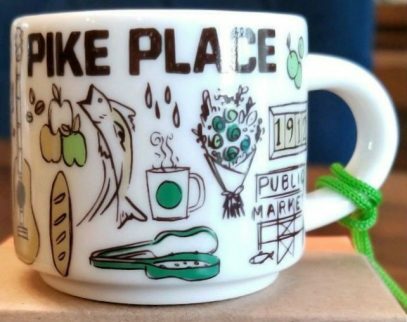 I somehow missed to add this mini mug to the site, and it’s a shame, because this one is special, since Starbucks Been There Ornament – Pike Place can only be bought in one store – The Pike Place Starbucks store, commonly called the Original Starbucks. That particular store has obviously found it’s place on the mug. The string is green.